Hi, Paul, please tell us a bit about yourself. Hi! I’m the author of Last Call at the Nightshade Lounge, which is my examination of the post-recession millennial existence. But I have a short attention span, so it also has demons and alcohol magic to keep things interesting. Other things about me: I love cooking, karaoke, punk rock, and Dungeons & Dragons. I’m the proud owner of a cat named Wrigley, and I sing lead in a band called Lemonbadd that only plays covers of songs from Adventure Time. When I was seven, I started reading Animorphs, and realized the name K.A. Applegate wasn’t just on the cover for decoration; it was the name of an actual woman who got to sit around and make up those books all day. Once I realized books were a thing people could make, and not some kind of crop harvested from a book farm, I wanted to be K.A. Applegate. 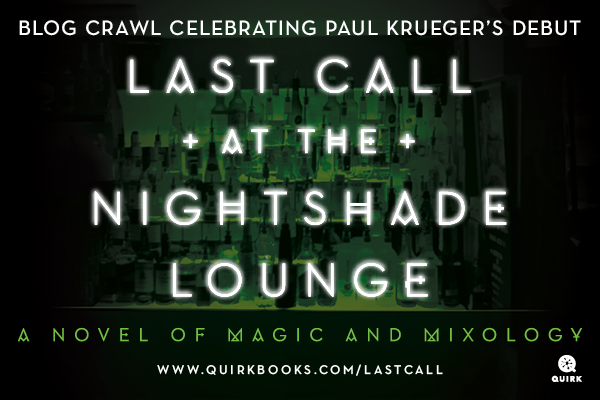 Last Call at the Nightshade Lounge is your debut novel. What has your publishing journey been like? In a word: bonkers. In two words: super bonkers. And in a few more than that: I’ve learned a lot, and I’ve had the privilege of meeting, befriending, and working with some of the most intelligent and generous people ever. I couldn’t be more grateful for everything I’ve gotten to experience along the way, and in a lot of ways I kind of still can’t believe any of it is happening. 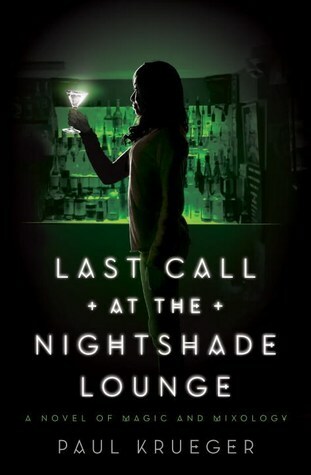 In Last Call at the Nightshade Lounge, new college grad Bailey gets hooked up with a group of monster-fighting bartenders and with the help of some magically mixed cocktails they are trying to rid of the streets of Chicago of these bloodthirsty monsters. I also read that you are a cocktail connoisseur. What is your cocktail of choice and if you had to come up with the perfect cocktail to pair with this novel, what would it be? My cocktail of choice is the old fashioned. It’s simple, delicious, and looks damned pretty sitting in a glass with a big chunk of ice. As for what cocktail pairs best with Last Call? I would say either the Bloody Mary or the mimosa, since you’ll probably need the wakeup after staying up all night to finish reading it. If you could have lunch with one of your characters, who would it be and what would you talk about? Vincent. Not that I don’t adore my younger set of characters, the Alechemists, but Vincent is a crotchety old punk rocker who has a lifetime of great stories to tell. And while it’s not officially established anywhere in the book, in my head he’s an excellent cook. I’d probably just sit at his counter while he chopped vegetables and ask him questions about the crazy things he’s done. A hot topic in the publishing industry lately has been the lack of diversity, both in the characters as well as authors in the industry. 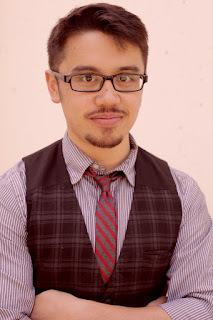 You are Asian American and your character Bailey is Asian American. Did you set out to write a book with a diverse cast or did it just naturally evolve that way? The only person in my cast I specifically set out to write “diversely” was Bailey. I’d long been afraid to tackle Asian-Americana in my work, because I feared I’d be seen as speaking for the whole community. She was my way of getting over that. With the others, the honest truth is it never occurred to me to write a cast that was anything but diverse. Writing a story set in Chicago with an entire cast cut from the same cloth wouldn’t have just made for a boring book; it would have been untrue to Chicago. But once I committed to having that representation in my work, I promised myself to tackle it responsibly, and only after many hours of research and carefully listening to members of the communities I was writing about. What advice do have for authors who are either from an under-represented group or wants to write a book with under-represented characters, but feel discouraged by the lack of diversity in publishing (perhaps they feel like they can’t get their story noticed)? Support other creators from disenfranchised communities. The system in place actively stacks the deck against us by enforcing unofficial quotas of how many books from a given demographic can appear on their list each year. I hold the opinion that our current renaissance of diversity has very little to do with the industry actually embracing the principles of diversity, and a lot to do with chasing trends. Now, I’m willing to take whatever advantage I can, and you should be, too. But when diversity stops being trendy, all those creators won’t necessarily be able to count on the system to back them anymore. So they’re going to need you. And if you support creators of color, or members of the queer community, or religious minorities, or what have you, you’ll find that when you need them, they’ll remember, and they’ll have your back, too. Your main character Bailey is a recent college graduate who is struggling to land her first “grown up” job. The timing of the release of Last Call at the Nightshade Lounge coincides with college graduations so I’m sure there a number of people in her shoes. I know I was when I first graduated college. Did you have a similar experience? What advice would you and Bailey give to these new graduates that are faced with “now what”? My first job after graduating was pouring lattes for the one percent at a busy coffee shop in downtown Manhattan. It was a little humiliating for someone with a fancy new degree, especially when people I knew came into the store and saw me in my work uniform. But as I put in my time there, I slowly grew to be proud of the work I did. People sneered at me and treated me like a vending machine in a hat, but what I learned was that they were wrong, not me. My job had value, and I wasn’t a less valuable person for being the one to do it. And that emotional journey for me was the direct inspiration for the one Bailey takes in Last Call. As for new grads who’ve just surfaced in the deep end and don’t know the way to dry land: just know that wherever you’re headed, you’ll get there eventually if you keep swimming anyway. Some people might get there faster than you, and some people might have more direct routes than yours, and that’s okay. And never forget, anyone you meet on your way up is someone you’re going to meet again on your way back down, so spend this time of your life making friends, not enemies. 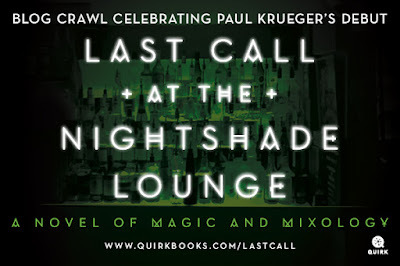 I’m really looking forward to reading Last Call at the Nightshade Lounge. Even though it isn’t something I would typically pick up, I was drawn to this new grad trying to find her place in the world. One of the reasons I don’t read a lot of fantasy is because I feel lost in all the mythos that surround the fantasy creatures. You created your own fantasy creature – tremens. How did you set about coming up with these monsters? Were there any legends or mythology that you drew upon as inspiration? Nope! The tremens were an original creation straight from my head. I originally was using folkloric monsters like trolls and oni, but my editor gave me a note telling me to come up with a new kind of monster instead. So I thought about it for a moment, and eventually made a simple decision: if my heroes were bartenders, then the obvious thing was to give them an enemy that drinks people. Thank you so much for taking the time to answer my questions. And congratulations on the publication of your debut novel. Do you have any other projects in the works that you would like to tell us about? I’ve got a few irons in the fire, but nothing I can directly talk about just yet. I can’t wait for the day I can, though, because I’m really excited about them all. Thanks for having me! Paul Krueger is a fantasy writer and cocktail connoisseur whose work has appeared in the Sword & Laser anthology. He lives in Los Angeles. Great interview Donna........an interesting character to say the least. Nice to hear from an debuting author. It reminds a bit of me a few years ago. Wishing best of luck to Paul! Great interview questions. I enjoyed Paul's responses and wish him luck on his debut novel. Sounds like a good read. Best of luck with your wring, Paul. What a great interview, Donna!